i looked after my niece today. we took a tram into the city, ate ice cream and spent the afternoon at the kids' museum. 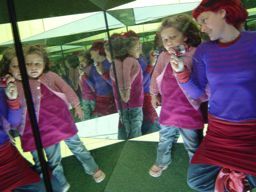 this pic was taken in a mirrored triangle where she learned the word 'reflection'.